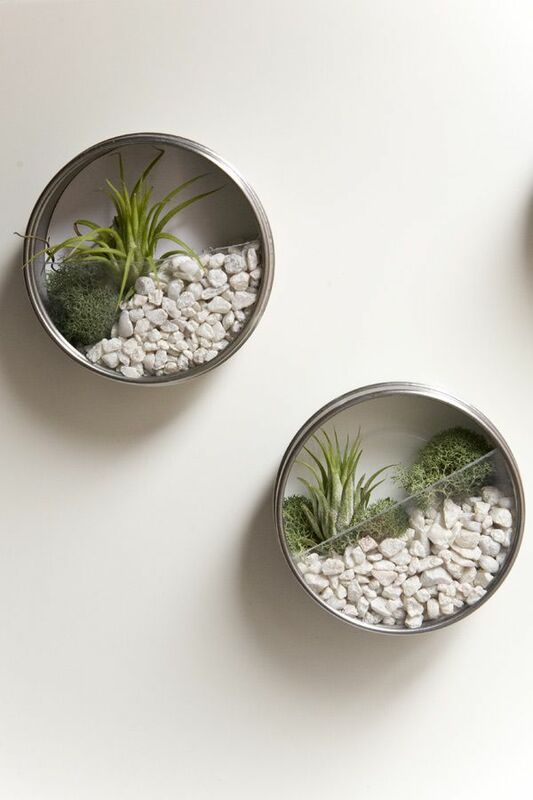 Spice tins make adorable mini terrariums you can hang on the fridge. They are a small, simple and easy project that anyone can tackle. They also make great gifts! Lanterns that have been spray painted gold give your terrarium a glam look! The gold color looks fabulous in winter or summer. Change out the types of plants depending on the season. Easter bunnies and pretty moss fill this beautiful glass jar. You can easily change out the items for the different season if you have a jar like this! Here is another beautiful beachy-themed terrarium. It's full of sand and beautiful green succulents. It uses a hurricane vase, but you can use any clear glass container! This adorable fall terrarium uses cute mini pumpkins and faux fall leaves. The colors are perfect for autumn. It's very easy to set up this seasonal terrarium and you can easily change out the items as the season changes! This adorable winter terrarium has little trees and a small winter village. Little trees or a winter scene would look adorable in any terrarium. Use Epsom salts as the base, so that it looks like snow!